That’s a great piece of work, @vcc, @Adam, @medworthy, @fasttech, @mabeleira, @GG_jr, do you have any suggestion? in order to have the same tests for each tester and on each version. This week-end was a really rainy, and I worked a lot on the wiki. I saw a little stuff in the user guides, and another stuff in the developer howtos. Rename the “Testing team” in “Quality Team”. These guys aren’t KAMIKAZES only, they are writing bug reports, they give return about working stuff too… They participe entirely in the NethServer quality. Reorganize the stuff in the wiki to make the Quality Team at the right valorized place, at the same level of User Guides and Developer HowTo in place to be hidden in userguides and developer howtos. I behind this! @dz00te @mabeleira, @medworthy, @fasttech, @GG_jr, @Adam what do you think? Totally agree, @dz00te would you like to lead this movement? You already wrote many helpful stuff! Take a look at user guides and developer howto to have inspiration. Now that github is our official bug tracker, how can we adapt this doc? @dz00te can I ask you to edit the first post and eventually move it on the wiki too? I want to note here that github now supports templates for replies and issues description! Are bug reports for NS7 going into this NS6 Project really? Or do you have a bug tracker for NS7 too? Also, the links are not up to date. 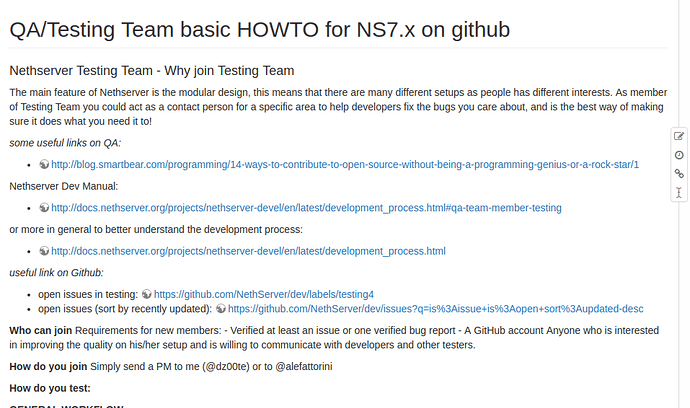 Are bug reports for NS7 going into this NS6 Project really? If a bug is found both on NS 6 and NS 7, we can track it on github and do a backport. If the bug affects only NS 6, we should open it on dev.nethserver.org, otherwise if the bug affects only NS 7, we should open it on github.